Last week I was invited along to private members family club, Maggie & Rose, in Kensington for the launch of the brand new Nuna IVVI pushchair. The launch was hosted by Kiddicare, through whom the stroller will be available exclusively in the middle of December. So! The Nuna IVVI! Where do I begin? Well you all know how fond I am of a lovely pram. My feelings towards pushchairs are not disimilar to the way most men feel about cars. I've been lucky enough to review a number of different brands with Daisy and Evie and am always very keen to hear about (and road test!) the latest model on the market. Nuna is a very smart, Dutch inspired brand of baby gear, founded by a father of two who wanted to combine style with functionality. Nuna products are made using incredibly high quality, durable materials and are created to grow with the child, and the IVVI certainly does just that. It is a luxury pushchair system, which comprises pushchair, carry cot, footmuff and compatible car seat. All components are available separately, which is something I really like when it comes to buying buggies. There's no point having something if you're not going to use it or be able to store it. The stroller seat (which, together with the chassis, retails at £600) is suitable from birth, meaning the carry cot (a perfectly affordable additional £200) isn't actually essential. It reclines fully horizontally with a very smooth one handed, five position recline (no jolty, awkward movements that may wake a napping small person!) and can be both parent, and outward facing too. The hood can be extended for particularly bright days (or if you're caught in light rain) and the multi-height adjustable handlebar is shaped for ultimate comfort. The pram is a dream to push. The three or five point harness doesn't require re-threading when being adjusted to fit a growing child (genius!) and the rubber, foam filled tyres are perfect for all terrains, with a lockable front swivvel wheel for extra bumpy journeys. The foot operated brake is easily to locate without looking and is super responsive and a zip on footmuff is available to keep passengers extra cosy during the winter months for an additional £70. Adaptors are available so that the Nuna PIPA car seat (or a Maxi-Cosi) can sit on the pram chassis - and rain covers come with both the basic stroller seat and the carry cot. One feature I particularly love is the small zip up compartment at the base of the carry cot - perfect for storing your keys and phone. 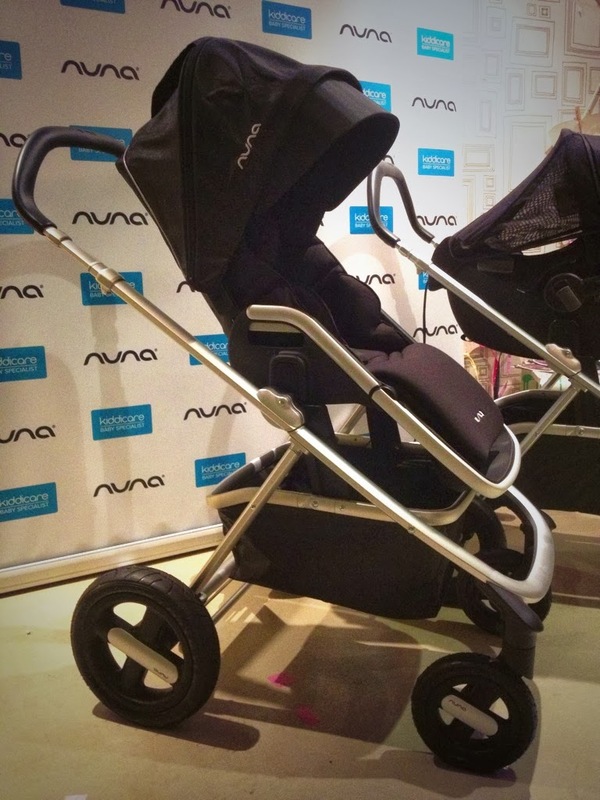 It's the small, thoughtful touches like this, together with the super stylish design that definitely make the Nuna IVVI a contender as one of the UK's favourite luxury prams. There's no denying this pram is particularly eye catching - the fluid aluminium lines are very smart - and the two colour ways in which it is available (safari or caviar) scream luxury. Let's be honest, no matter how amazing a pram is to use, it has to be a beaut too! But don't just take it from me - check out this video to see just how gorgeous and simple to use really is.... I'm in love! I was not paid to write this review.